Yeah, but: It's not nearly as scary the second time. The Long Version: Green Clean is the European brand that makes a number of useful products for photographers. My favourite so far has been the Wet/Dry lens wipes, which really do work better than the one-step alternatives that I use, and they also make an innovative vacuum system that's powered by canisters of compressed gas. I had mixed results with my vacuum, but Adam Marelli reports good success when spending time in dustier conditions than anything I've ever faced. In general, when given a choice between believing me and some other authority, my money's on the other guy – although in this case the different cameras we use, one with and one without an integrated anti-dust system on the sensor, might also account for the different experience. 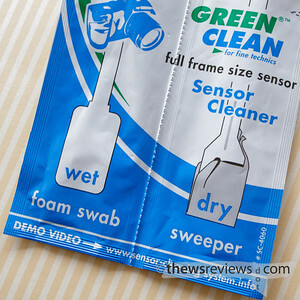 But the Green Clean vacuum system is only half of the Green Clean Sensor Kit, so for this review I've been testing out the wet/dry sensor swabs. Like the wet/dry lens tissues that I really like, these are packaged together in their own envelopes which makes them very convenient to use. Essentially these are tissue swabs on disposable spatulas, and there's no separate fluid or bits needed. 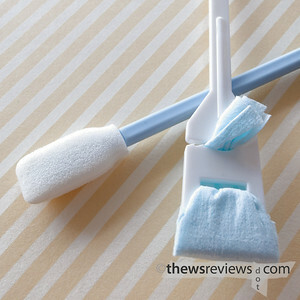 I have to confess that the first time I tried these sensor swabs I did a pretty bad job with it. Relieved to be free of the fussiness of the Visible Dust fluid and swab system, I may have been over-enthusiastic with the wet Green Clean swab. Okay, I'll admit that I scrubbed like I was cleaning the bathtub, and unsurprisingly the dry swab just wasn't able to cope with the aftermath. The results were bad, and I should have known better. On the bright side, it was a learning experience, and my D700 and I were both okay after a little extra work. But the snag is that it's tough to test a sensor cleaner on a clean sensor, so that little user-error episode did derail writing this review for a couple of months. But eventually I was able to redo the test, and took a little more care, with much better results. I've never quite managed to have my sensor completely spot-free when I really go hunting for them, but this brought me as close as I've ever been with remarkably little fuss. Sensor cleaning is something to be avoided as much as possible and done well when necessary. The Green Clean system is simple and works well: the self-contained twin envelope makes it perfect for travelling, and the results are as good as anything I've tried at home. It's certainly something that I would throw in the bag for a road trip, which isn't something I can say for the other 'wet cleaning' methods that I've tried. I'm convinced.